A love of flying keeps Cape Air CEO Dan Wolf in the pilot's seat of his regional airline. Cape Air at a glance. 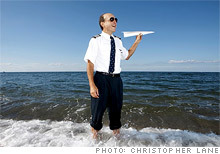 (Fortune Magazine) -- I was one of those kids always intrigued by the whole idea of flying. I used to hang out at the airports whenever I could. In the summers between years at Wesleyan, I learned to fly around Cape Cod. The more I did it, the more I loved it. I took my last semester of college off to become an instructor and commercial pilot. Be willing to pay your dues. I finished college in 1980 and then took a couple of months and flew to Alaska and back with just a sleeping bag, a tent, and some camping equipment. I flew from Massachusetts out to L.A. and then up the coast in an airplane that's made out of fabric. It burned about four gallons of gas an hour -- good mileage by today's auto standards. I spent about three months flying around North America in that little fabric plane. Then I ended up back on the Cape. I determined that it might be a good idea if I had some mechanical training, so I spent two years studying and became a licensed aircraft mechanic. Be ready to act when an opportunity arises. Cape Air didn't start out as an airline. It started in 1988 as a flight school, maintenance shop, and fueling operation. The company did charters as well. While we were doing all that, the Provincetown-Boston route became available. Continental Connection was flying it and indicated it was pulling out. We were steeped in aviation with a hankering to get into it, and that became our first route. Stay close to your consumer. There are airline CEOs who make a point to be active on the front lines -- handing out nuts and meeting passengers in the airplane -- but I really love the idea of still being able to fly. I make it a point to fly Saturdays in the summer because I know we're busy. I'll see how the operation is working, and since I'm flying on the weekend, I'm not taking time away from my desk job. The idea that entrepreneurs are self-made is a myth. Behind any great entrepreneur there's a whole team of people. That's why when I hire I focus on people whose egos are last and whose desire to work collaboratively are first. The two most important things in business are humor and humility. You've got to have a sense of humor to be able to react to things and to keep things in perspective. In this business you can't take yourself too seriously because if you do, you're going to get eaten up.